Spring bulbs faithfully reappear at the most advantageous time – after a long, cold winter, just when we’re longing for bright colors to relieve the monotony of winter snow and ice. Most spring bulbs are perennial and multiply in number every year, bringing more beauty to the flowerbeds each spring, but some problems can destroy a carefully planted bulb bed. 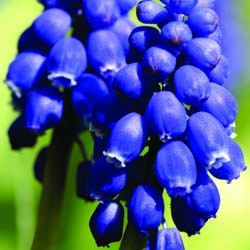 Seemingly carefree, bulbs do require a bit of nurturing to ensure they perform their very best for years to come. Good soil drainage is important to prevent bulbs from rotting so plan your site accordingly. Do not plant bulbs near areas where downspouts let out or large snow piles may build up and spring melt can drown bulbs. When planting bulbs in the fall, add a high phosphorus fertilizer to the planting hole for the development of strong roots. This will help the bulbs establish well so they can renew themselves each year. Bulb foliage will often break through the soil after a few warm winter days. This vegetation is hardy and its exposure to the cold will not damage your plants or prevent them from blooming. There is no need to cover, wrap or otherwise protect this initial foliage. 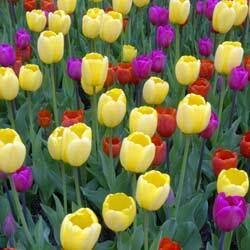 Fertilize bulbs as plants are emerging from the ground. Do not fertilize once flowers appear. Use a 5-10-5 granular fertilizer to assist in foliage and flower development, ideally one that is formulated especially for bulbs. After blooming, cut back the flower stalk. This will force the plant to put its energy into the bulb for next year’s flowers and not into seed production that would dampen the strength of the bulb. Allow the leaves to die back naturally. The leaves are vital for producing food that is stored in the bulb for next year’s growth. Cut leaves, never pull, once they have turned yellow – pulling can damage the bulb. Do not tie leaves as this reduces the leaf surface required for adequate food production. When the foliage has completely died back the bulb is dormant, and this is the proper time to dig and separate bulbs if necessary. Flowering will often be reduced when bulb beds become over-crowded. If division is needed, bulbs should be dug and stored in a cool, dry, well-ventilated place and replanted in the fall. Fertilize bulbs again in the fall with a high-phosphorus, granular fertilizer. With thoughtful care, you can easily help your bulbs reach their full potential and they will thrive for many years.